Aquaworld Aquarium - Article - Endler's Livebearer It's a Guppy! In 1997 I was searching the internet for a new livebearer I had seen in my local fish store that were not for sale, called an Endler's Livebearer (ELB). I could only find one reference to it on a message board, and no photos existed on the internet. None of the books in my fish book library had photos or a paragraph on the fish. Luckily for me, through friends in the pet trade, I was able to track down a couple dozen ELBs from someone that had a breeding colony in one of his planted tanks. I emailed Dr. John Endler and asked him if I were to send him a photo of the fish I had acquired if he could verify if they are the livebearer named after him by aquarium hobbyist. He verified that they were indeed the fish. I emailed John that I was going to write an article about the fish and post it on the internet. I asked him if he could provide me with his story about the fish and that I would include it in the article. After a few emails back and forth a final article was developed about the Endler's Livebearer and posted on the internet with photos for the first time. Since then, the popularity of Endler's Livebearer has exploded, with multiple web sites dedicated just for the ELB. Some hobbyist since then have made the trip to Laguna de Patos in Venezuela as well as other locations in the area to collect new wild stock. There are now commercial hatcheries breeding ELBs for the aquarium trade, as well as some hybrids. Unfortunately for the aquarium hobbyist, usually only the male ELB is offered for sale through the trade. The good news is, many local aquarium club members have breeding colonies that they are often willing to share with other hobbyists. In 2005 Fred Poeser, Michael Kempkes and Isaac Isbrucker published their work in Contributions to Zoology for giving ELB separate species status from Poecilia reticulata (guppy). They gave it a new species name (wingei). Their effort was a lot of work for nothing as it did not pass the peer review test to be accepted as new species. Evidence that ELB was indeed a guppy (Poecilia reticulata) had already been posted on the internet at least a year before they published their work. ELB meets the criteria for being included as a population guppies. ELB do freely interbreed with other guppies. 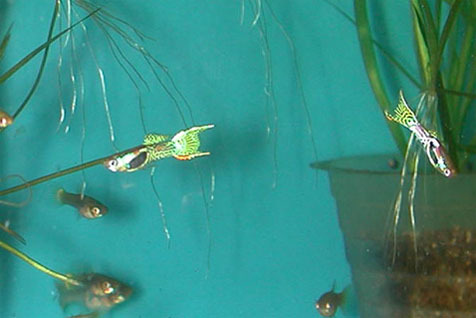 The cross of ELB with other guppies produces viable offspring that are fertile. Because of this fact, they cannot be a different species from P. reticulata. The definition of a species is a group of organisms capable of interbreeding and producing fertile offspring. In 2004 the California Tiger Endler's Livebearer was published on Aquaworld Aquarium's web site. 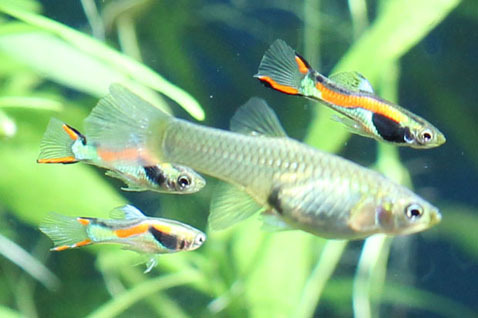 This article outlined how the breed was developed from a cross between a ELB and a guppy. The hybrid was then line bred until the offspring bred true. This would not have been possible if the ELB and guppy were different species. California Tiger Endler's Livebearer first offered to the aquarium hobby in 2004. It took about a year to develop this breed of guppy so that it would breed true. It would not have been possible to develop this fish if Endler's livebearer were a separate species from Poecilia reticulata. A subdivision of a species: as a : a category in biological classification that ranks immediately below a species and designates a population of a particular geographic region genetically distinguishable from other such populations of the same species and capable of interbreeding successfully with them where its range overlaps theirs. A named subdivision (as a race or variety) of a taxonomic species. It is of my opinion that the ELB should be named Poecilia reticulata endleri, in recognition of Dr. John Endler, the man who brought this fish to the attention of the world. This would be the correct classification of the Endler's Livebearer.